Meredith Vieira celebrated her final "Today" show this morning. Starting tomorrow, Ann Curry takes over as co-host. "I'm going to miss saying that..."
As Meredith Vieira tossed to Ann Curry at the news desk, something she'd done countless times during her five year tenure as co-host alongside Matt Lauer, the realization that this would be Vieira's final show seemed to sink in. "Today" sent Vieira off in epic style - with video tributes from NBC colleagues like "Nightly News" anchor Brian Williams as well as a not one, not two, but three major musical tributes - the icing on the cake being a live jaunt through the NBC offices where crew members and special guests ran alongside Vieira to Journey's "Don't Stop Believing." As the show progressed, an increasingly emotional Vieira admitted she's "just trying to hold it together" as she joined Lauer and Al Roker outside in the plaza, where they were surrounded by fans holding various "Good-bye Meredith" signs. Vieira's dog, Jasper, also joined the trio as it ran around the plaza. Back inside, the entire "Today" crew - Vieira, Lauer, and Roker were joined by Curry and Natale Morales - gathered on the couch to watch a montage of highlights from Vieira's "Today" run. The video tribute combined both the comedic highlights and emotional news events Vieira experienced during her time on the show. As if that weren't enough, Lauer then recounted an anecdote Vieira had relayed to him years earlier, revealing that she had played Carole King's "You've Got a Friend" 30 times in a row following her high school graduation. On cue, King herself entered the studio and serenaded Vieira, who sang along as best she could through the tears. For the grand finale, Lauer donned a "Matt Hearts Meredith" T-shirt and kicked off a sprawling music number where Meredith was led through the NBC offices and joined by the entire staff and crew (all wearing similar shirts) for a lip-synched dance number choreographed to "Don't Stop Believing." Special guests including Abe Vigoda and JImmy Fallon, who supplied a hammy guitar solo. "It was unfair of us," jokes Lauer afterwards. "To make you sprint through the plaza on your last day." Lauer then admitted that he often falls on "jokes and sarcasm" when discussing Vieira because otherwise he'd "turn into a blubbering idiot." Michelle Franzen takes a look back at Meredith Vieira's tenure on the Today Show. A sobbing Vieira sat among her co-hosts and said good-bye to the show she has called home since 2006. 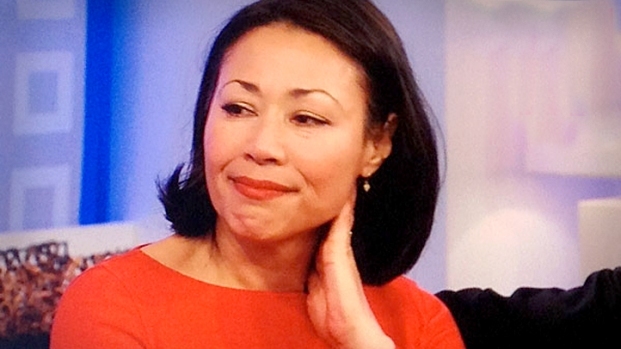 Starting tomorrow, Ann Curry will take over as co-host alongside Matt Lauer. "You will always, always have a spot in our hearts," said an emotional Roker. "I love you." "I don't want to go now!" jokes Vieira following the outpouring from her co-hosts.